David Fincher's downbeat and overlong neo-noir thriller pits two cops (Mark Ruffalo and Anthony Edwards) and two newspapermen (Jake Gyllenhaal and Robert Downey Jr) against an anarchic serial killer. 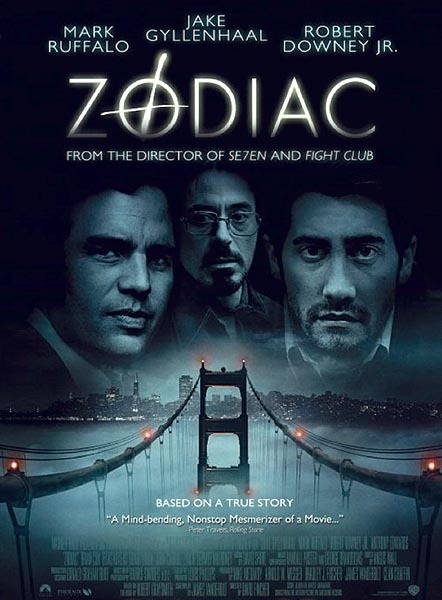 The incidents depicted are real - the Zodiac killer terrorised California throughout the late sixties and early seventies and was never captured, despite a number of promising leads. Both the mercurial ace-reporter played and Ruffalo's character (the San Francisco cop who was the real-life inspiration for Steve McQueen's Bullitt) make fun of Gyllenhaal's self-confessed fondness for libraries. While they kick down doors and hide in the shadows of abandoned warehouses, he borrows books on psychology and code-breaking. Needless to say, our lonely library-goer is nerdish and cannot manage small-talk, the type of man who trips over himself and upsets coffee cups. Downey and Ruffalo dress like they're about to appear on the cover of an expensive lifestyle magazine. Gyllenhaal dresses... well, like he's about to take a trip to the library. 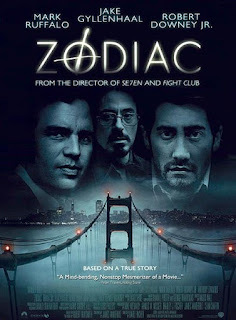 Yet, at the film's end, it is Gyllenhaal who comes closest to catching the Zodiac killer. Downey hits the bottle and meanders into obscurity and white undershirts. Ruffalo is haunted by guilt and bitterness. Gyllenhaal writes a book that sells four million copies. And he gets the girl, though she does look like a librarian.